Over a hundred years ago, in the rolling hills of Kentucky, there lived a famed horsewoman who was the daughter of Randolph Corbett a famous breeder. Her family was know for breeding the finest thoroughbred race horses in the world. Her life began like a storybook tale of love and success. Mary was beautiful and rich and popular. Everyone loved her. She married a wealthy judge named Wheedon and together they continued building on her father's equine empire She had a beautiful son named Randolph. She raised him well and he won a scholarship to the University of Virginia. Sadly, even storybook tales can end in tragedy and Mary Wheedon was destined for great tragedy. After her son left home, he showed terrible judgement in all manners financial. He invested in one con artist's scheme after another, bleeding Mary dry and destroying his family fortune. She tried to keep her son's problem's secret from her husband, Judge Wheedon, but when her beloved baby boy shot himself, all of his bad decisions came to the surface. It wasn't long after her son died that the stock market crashed reducing Judge Wheedon's fortune to nothing. They say the stress was too much on the Judge's heart and he died a few days later. Mary was destitute. She had nothing left. The sudden, accumulation of horror was too much for Mary. After this, she vanished from society. She vanished and left everything behind but her favorite horse. Mary's favorite horse was named Hussar's Gold and he was, in fact, the fastest race horse alive, so even after she vanished there were those that sought her out and looked for her horse. It was twelve years before Mary was seen again. Two lost travelers came upon her. She found them wandering the woods by Lexington. She walked side by side with an enormous gold stallion. 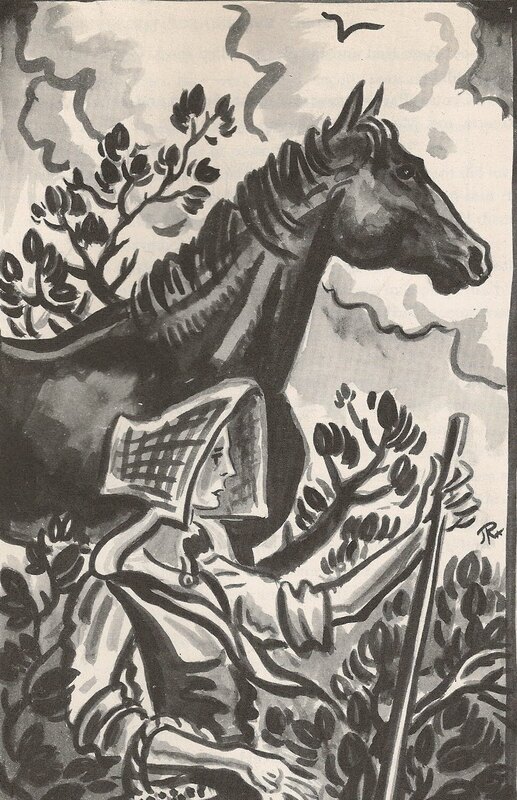 Her horse and she guided the two lost travellers to Lexington. Others sought Mary out after this. They tried to convince her to sell her horse and buy back her life. But Mary wouldn't hear it. People who saw her said she spoke to the horse like a friend and they wandered the woods together like they were family. Time past and it can be assumed Mary and her beautiful stallion died in the shadowy woods of old Kentucky. However, children and adults as well still tell stories of meeting a ghostly woman and her horse in the old woods near Covington. Mary and her horse linger there as they did in life. Those who see her say that Mary still talks to her horse and that he nods his head in understanding. Story taken from James Reynold's Ghosts in American Houses, which was among my grandmother's ghost story collection. Love that story. And perfect timing. We are working on a ghost horse for the display this year. I can't wait to see your ghost horse! Your work is wonderful. I love this story...brings tears to my eyes. I'm a bit of a horse nut myself (I have 2 horses) so I can completely understand her talking to her horse and him listening. I'm a horse person too! I had horses on my grandmother's farm as a girl. Now I have cats and dogs, but whatever the animal I can relate to finding an animal that you need and love and understands you.